Sometimes all the thatching aerating and overseeding just doesn’t help and in order to get that perfect lawn back, you have to rip out whats there and start over. Guess what? There’s a tool for that! The first thing is to run down to your local rental store…. (we prefer this one – Aurora Rents)…and pick up a sod cutter. 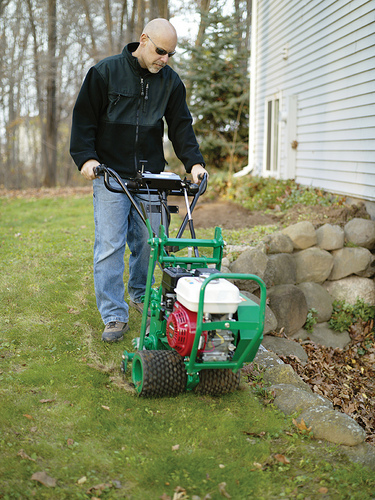 We offer sod cutters in two sizes either a 12″ sod cutter or an 18″ sod cutter. The first inclination is to go with the bigger unit so it gets done faster, while this is true just remember you are going to be rolling this sod up and removing it and 18″ of sod is a lot heavier than 12″! So with that said its time to get busy, the sod cutter is going to remove approximately the first 1 1/2″ of dirt and grass. Once this is removed you are going to end up with a dirt yard that is most likely compacted and uneven. Now its time to break out a tiller, for most yards I would recommend a rear tine tiller that is self propelled. We do have smaller tillers but those are typically used for small gardens or very soft soil. Now would be a good time to add top soil and possibly lime to the yard and till everything up. There are many sources to dive into how much of each you may need. One of the sites I liked was our local gardening hero Ciscoe. So now you have a tilled up yard that really isn’t too impressive, lets change that. The next items that will help you out will be a landscape rake and a lawn roller. With the landscape rake you can level out the yard and remove any large rocks that have worked there way to the surface, things are starting to take shape now. Now to really leave an impression….fill the lawn roller with water and start rolling out your fancy new yard. Once the lawn is rolled completely you want to fill any low spots and make sure you are happy with how the surface looks, because this is going to be the final step before planting seed! Now its time to add fertilizer and seed (again research is your friend here depending on how much sunlight, shade get your yard tends to get there are many types of seed and everybody has an opinion) If you are more of the instant gratification sort, this is the time to lay new sod, if not seed away! Once the new seed or new sod is on the ground its time to bust out the lawn roller again. If new seed was put down laying down a layer of peat moss with a roller is probably a good idea. Now all the hard work is done! The new grass is going to like a good amount of water especially if the weather gets warm. (hey we can be optimistic!) Time to sit back and watch the grass grow.